As a result of the fast pace at which Mantra has grown this year, I am issuing this letter to provide a comprehensive update of the company's activities and initiatives. I am very pleased with how the business has been developing, as industry, governments, and investors across the globe are beginning to appreciate the value of Mantra's innovative technologies. To begin with, our successful capital raise in March has allowed us to build out our core team with the skills necessary to develop both our technologies and our business. Our new research facilities in Vancouver and corporate office in Surrey now host a team of 16, including Ph.D. engineers and scientists, technical support staff, and management. As a result of the innovative and environmentally beneficial nature of Mantra's technologies, financial support has been awarded for many of these staff members from federal funding organizations, totaling $239,500 over two years. Specifically, this year has seen the addition of Drs. AshwinUsgaocar, PiotrForysinski, Christina Gyenge and TirdadNickchi to the Mantra team. Each of these highly skilled scientists brings an invaluable contribution to the company's core competence, and the benefits have already been realized in the design of our products, processes, and business strategies. The Scientific Advisory Board has been bolstered by the membership of highly respected UNM scientists Professor PlamenAtanassov and Dr. Alexey Serov. Randy Gue, a 30–year Lafarge veteran, has joined the management team. Most importantly, the growth of our team has allowed us to ensure that our state–of–the–arttechnology demonstration projects see a successful and effective deployment. We have continued to innovate on our process for the Electro–Reduction of CO2 (ERC), realizing significant process and reactor design improvements over the past year. These have been and continue to be integrated into Mantra's ERC pilot plant, the first of its kind in the world, and are the subject of recent patent filings. As a result of recent high profile opportunities regarding the deployment and operation of the innovative ERC plant, a comprehensive update on this project will be issued in January. recycling in Lyon, France, I am confident that Mantra remains an industry leader and that this pilot demonstration will receive a great deal of international attention. The granting of Mantra's Canadian patent for the ERC technology in September has further bolstered this project. We have also been successful with a series of significant design improvements for our novel Mixed–Reactant Fuel Cell (MRFC). These improvements have been facilitated in part by our use of 3D printing for cell components, a strategy that allows us to rapidly screen and refine new design concepts. We have, through our highly talented research team, additionally re–engineered a secondary 3D printer to serve as a CNC spraying machine to produce higher quality, reproducible fuel cell electrodes. This focus on innovation has resulted in a more powerful system; in fact, recent laboratory work has shown an unexpected linearity in the scale–up of bipolar units, a very positive result that will greatly benefit the system design moving forward. As a result of our efforts in using innovative technologies and strategies to develop our product, the MRFC demonstration will be pushed out to January; allowing us to demonstrate a significantly more robust and sophisticated product. The issuance of the US patent for the MRFC technology has further strengthened our position in the industry, and this will serve as the basis of additional IP creation moving forward. On top of the research and development work being done internally in support of these projects, we have established excellent relationships with several universities across North America, including UBC and INRS. Through government–sponsored projects, including a recently awarded NSERC Strategic Project Grant, we have access to some of the brightest minds in electrochemistry and catalysis, which have led to valuable technical contributions. to new products developed by Mantra. Mantra's interest in these areas is in part due to the large regional, national and international funding opportunities available specifically for our technologies. The company is dedicated to accessing public funding for its projects whenever possible, and thereby maximizing the value of these projects for its shareholders. Given the innovative nature of our business, the positive reception we have had across regions, and the interest from large industrial partners, we are confident that in the coming year we will successfully obtain a large grant for a pre–commercial technology deployment. As always, intellectual property remains Mantra's most critical asset. We are extremely pleased to now have our core ERC patent awarded in four of the six jurisdictions applied, and the core MRFC patent in two of the three. In the interest of expanding this value, and as a result of successful laboratory–scale development, we have over the past year filed an additional five patent applications covering various aspects of our technologies. Our demonstration projects, being the first of their kind, will serve to produce a new generation of intellectual property that will further solidify Mantra's position as a global leader. The company has been further validated through the receipt its firstrecurring revenue, totaling over $330,000 to date, and the establishment and maintenance of close relationships with large multinational companies. As per recent developments, the recurring revenue stream will continue to support our research and development activities as we move our products to the market, and our partners will provide the platform from which this market penetration can be successfully executed. Looking forward, 2015 is the year in which Mantra will showcase a multitude of first–of–their–kind technology demonstrations. This includes two demonstrations of ERC for the production of a suite of valuable chemicals from CO2, and the demonstration MRFC for large–market applications such as backup and stationary power, industrial equipment, and transportation. Because we have based these demonstration projects on the highest quality research and engineering, we expect their success will lead to the company's first early license adoptions this year, catapulting Mantra to the next stage of growth. I look forward to taking these groundbreaking steps with you, thank you for your support in 2014, and wish you the best in the coming year. Mantra Venture Group Ltd. (OTCQB:MVTG) is a clean technology incubator that takes innovative emerging technologies and moves them towards commercialization. The Company, through its subsidiary Mantra Energy Alternatives, is currently developing two groundbreaking electrochemical technologies designed to make reducing greenhouse gas emissions profitable, ERC (Electro–Reduction of Carbon Dioxide) and MRFC (Mixed–Reactant Fuel Cell). ERCis a form of “carbon capture and utilization” (CCU) that converts the polluting greenhouse gas carbon dioxide into useful, valuable products including formic acid and formate salts. By utilizing clean electricity, the process offers the potential for an industrial plant to reduce emissions while generating a salable product and a profit. The MRFC is an unconventional fuel cell that uses a mixture of fuel and oxidant, thereby greatly reducing the complexity and cost of the fuel cell system. Ideal for portable applications, the MRFC is cheaper, lighter, and more compact than conventional fuel cell technologies. Forward–looking statements:Except for the historical information contained herein, the matters discussed in this press release are forward–looking statements. Actual results may differ materially from those described in forward–looking statements and are subject to risks and uncertainties. See Mantra Venture Group's filings with the Securities and Exchange Commission, which identify specific factors that may cause actual results or events to differ materially from those described in forward–looking statements. NEW YORK, NY—(Marketwired – Dec 30, 2014) – As pioneers of the extended–stay, Residence Inn is committed to accommodating a wide range of guests with wide ranges of needs. Recently, the Residence Inn hotel in Times Square put their mission to the test. Two African Penguins — Patrick and Simon — were the stars of Residence Inn's 2014 “It's not a room. It's a residence.” campaign, inviting guests to “work, play, and chill.” That's exactly what Simon and Patrick did during their one night stay earlier this year. Simon and Patrick were accompanied by two handlers and made their trip from The National Aviary in Pittsburgh, PA. These road weary travelers were relieved to have free range of their spacious, functional, and on–trend Times Square hotel. Never ones to turn away from the spotlight, Simon and Patrick were distinguished guests on the Meredith Vieira show. For a backstage look at Simon and Patrick's spot on Meredith's show, check out this facts page: http://meredithvieirashow.com/articles/facts–about–the–winter–wonderland–animals/. The adorable African Penguins along with Fleury the Snow Owl, Lucille the Siberian Lynx, and Sven the Reindeer stole the December 9th show. These stars were a natural fit for their hotel in the theatre district. Patrick and Simon were allowed to walk freely throughout the Residence Inn's lobby — hopping on check–in counters, waddling into the Market perusing for snacks, even taking elevator rides. Their handler stayed close by, but Patrick and Simon were going to do what they wanted. While they left no space unexplored, most of their attention was committed to the hotel's lobby waterfall, splashing and having fun. While Patrick and Simon were fascinated by their new environment, guests were fascinated by them. Penguins are incredibly social birds, so Patrick and Simon made a lot of friends during their stay. Patrick and Simon were exemplary guests — the African Penguins were very low maintenance, and they left their room neat and tidy. That's not to say cleanliness is a requirement of this NYC pet friendly hotel. Residence Inn New York Manhattan/Times Square welcomes furry friends, even if they get a little messy. Although, Patrick and Simon have set the bar pretty high. 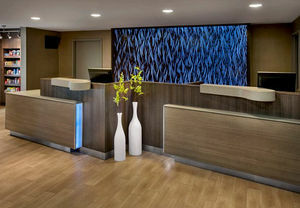 The Residence Inn Manhattan/Times Square puts guests right in the heart of all the buzz and energy of New York City. A day or two would never be enough to even scratch the surface of New York City's attractions and Residence Inn specializes in extended stays, perfect for exploring Times Square, Central Park, Rockefeller Center, The Empire State Building, Bryant Park, or checking out one or three of the over forty shows on Broadway all in their own unique, storied theatre. All that is just a few short blocks in any direction from the hotel, and without leaving Midtown. Ideal for a business trip or a much needed vacation, Residence Inn anticipates the needs of long–term stay travelers and has elevated the typical hotel room into something that feels more like a personal apartment with suite–style arrangements, deluxe kitchenettes, and plenty of space to work, live, and relax. Complimentary high speed internet and flat screen TVs, surrounded by the room's plush bedding tops off the in–room experience. Studio 100, the property's on–site lounge with billiard room is a great space for socializing and adds the urbane sophistication expected from Manhattan hotels. Residence Inn New York Manhattan/Times Square is the first choice in Midtown Manhattan for meeting planners, couples, and families alike. NEWARK, NJ—(Marketwired – Dec 30, 2014) – Oftentimes, business travel demands that a company's road warrior dive right in to the heart of the action, wherever it is. The business trip isn't the meetings, or the sales pitch, or even dinners with clients — that's the job. The business trip is what bookends the job — airport trips, hotel stays, the essential details we take for granted. 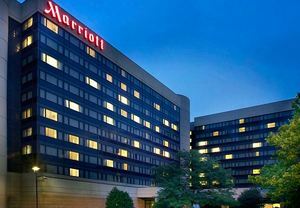 At Newark International Airport, Marriott is offering guests an easy Newark hotel deal that makes leaving town or getting into New York City stress–free. Marriott's Newark Airport hotel is offering an ongoing “Park and Fly” package. Through their offer, guests can save on airport parking, cab fare, and fair room rates. The Park and Fly package averages $229.00 per room night. Included in the offer is one room night at the hotel on–site, eight days of parking, and transportation to and from the airport provided by Marriott. Considering parking at Newark Liberty International Airport is a $40.00 daily rate, the value is immense. New Yorkers and New Jersey natives are no strangers to traffic. Nothing can derail a trip more than running late because of congestion on the George Washington Bridge or the glacial pace of Midtown at rush hour. The Newark Liberty International Airport Marriott is located on Airport property, and only requires a shuttle ride of just a few short minutes. Being at the airport the night before allows for a restful night's sleep and a leisurely paced morning so that your trip starts off on a positive note. Marriott isn't just the most convenient Newark Airport hotel, with its Park and Fly package, it's the most sensible. With the New Year just days away, tourists will be pouring in to New York City for the city's spectacular New Year's Eve celebration to check off their bucket lists, while business travelers will be dotting the country making sure their offices nationwide are prepared for the upcoming quarter. For either traveler, more information about this Newark airport hotel deal can be found by calling 1–973–623–0006 — rates may vary depending upon travel dates. MONTREAL, QUEBEC—(Marketwired – Dec 30, 2014) – TVA Group (TSX:TVA.B), a subsidiary of Quebecor Media, announced today that it has closed the acquisition of the assets of Vision Globale after obtaining Competition Bureau consent for the transaction. Vision Globale has distinguished itself in the film and television industry with its soundstage and equipment leasing services and film and television post–production services. The acquired assets include the movie and television studios Mel's in Montreal and Melrose in Saint–Hubert, facilities that are used for both local and foreign film and television production, including American blockbusters. In connection with the closing of the Vision Globale acquisition, Quebecor Media provided today TVA Group with a bridge loan of $100 million under the terms of a credit agreement entered into on the date hereof (the “Bridge Facility”). The Bridge Facility is unsecured. It matures 90 days following the date hereof, with an option to renew for a further 90–day period at the request of TVA Group, and provides for voluntary prepayments without premium or penalty. The Bridge Facility, or the advance thereunder, as the case may be, is not: convertible, directly or indirectly, into equity or voting securities of TVA Group or any of its subsidiaries, or otherwise participating in nature; or repayable as to principal or interest, directly or indirectly, in equity or voting securities of TVA Group or any of its subsidiaries. The Bridge Facility was approved by the board of directors of the TVA Group and by the independent members of the board, having determined that the Bridge Facility was obtained by TVA Group on reasonable commercial terms that are not less advantageous to TVA Group than if the Bridge Facility was obtained from a person dealing at arm's length with TVA Group. This press release contains certain forward–looking statements. All statements other than statements of historical fact included in this press release may be forward–looking statements. These forward–looking statements, by their nature, necessarily involve risks and uncertainties that could cause actual results to differ materially from those contemplated by these forward–looking statements. Forward statements in this press release include statements relating to: i) TVA Group's strategic plan and its implementation; ii) business strategies and management strategies and the potential impact and benefits of the transaction; and iii) the objectives of the transaction. We consider the assumptions on which these forward–looking statements are based to be reasonable, but caution the reader that these assumptions regarding future events, many of which are beyond our control, may ultimately prove to be incorrect since they are subject to risks and uncertainties that affect us. Due to such risks and uncertainties, readers are cautioned not to place undue reliance on such forward–looking statements, which speak only as of the date hereof. We disclaim any intention or obligation to update or revise any forward–looking statements, whether as a result of new information, future events or otherwise, except as required by applicable securities legislation. All amounts are in Canadian dollars. TVA Group, a subsidiary of Quebecor Media, is an integrated communications company engaged in the creation, production and distribution of audiovisual products, and in magazine publishing. TVA Group is the largest broadcaster of French–language entertainment, information and public affairs programming and publisher of French–language magazines in North America, and one of the largest private–sector producers of French–language content in North America. Its Class B shares are listed on the Toronto Stock Exchange under the ticker symbol TVA.B. GREAT BARRINGTON, MA—(Marketwired – Dec 30, 2014) – Few destinations can boast the vital components of a winter wonderland quite like the Fairfield Inn & Suites Lenox Great Barrington/Berkshires. In addition to offering some of the most exciting ski specials in Great Barrington, the hotel enjoys a location just minutes away from the town's numerous attractions and events. And when guests return at the end of the day, the property's stylish setting and value–added amenities mean they enjoy their evenings in as much as their days out and about. Situated among hotels near Ski Butternut and the Catamount Ski Area, the property affords easy access to whichever skiing destination travelers prefer with packages that are equally flexible. Guests enjoy one lift ticket to the mountain of their choice, daily hot breakfast and overnight accommodations featuring privileges at the hotel's indoor pool and whirlpool, 24–hour fitness facility and game room. The hotel rooms are also some of the most inviting in Great Barrington, with amenities like free Wi–Fi, pillow–top mattresses and in–room microwaves and refrigerators. While the powder is the primary attraction, the surrounding area is home to a diverse range of entertainments. Arts aficionados, for example, might coordinate a visit around the Mahaiwe Performing Arts Center's showing of London's National Theatre in HD: “Treasure Island” on January 24, 2015, or the Bolshoi Ballet in HD: “Swan Lake” on January 25. And music lovers might build a trip around seeing the film star Jeff Daniels take the stage on January 15 with The Ben Daniels Band. The Norman Rockwell Museum, meanwhile, perfectly complements a city ranked by Smithsonian magazine as the No. 1 Small Town in America. Plus its current exhibition, “Norman Rockwell: Home for the Holidays,” hits just the right note of seasonal spirit and American charm. Other attractions, like farmer's markets, the Berkshire Museum's Festival of Trees and snowshoeing through Bartholomew's Cobble, only enhance one's stay at this Catamount Ski Area hotel. Ski packages are available Sunday night, ski Monday through Thursday night, ski Friday, except during holidays. Rates start at $140 per night but vary depending on room type and the number of guests. Travelers are encouraged to call the hotel at 1–413–644–3200 for details and reservations. Located near Route 7 in the Berkshires, the Fairfield Inn & Suites Lenox Great Barrington/Berkshires welcomes visitors with modern style, attentive service and luxurious comfort. Guests can look forward to starting each day with complimentary hot breakfasts before exploring area attractions like museums, historic sites and plenty of outdoor recreation. Travelers also find themselves within walking distance of some of the area's best restaurants, which serve everything from ethnic to farm–to–table menus. Whether visitors spend their days exploring the area or working within the hotel's 1,247–square–foot meeting room, they can unwind each night with a swim in the heated saltwater pool, a workout in the state–of–the–art fitness center or by simply enjoying the spacious guest rooms' plush bedding, Wi–Fi and other amenities. ORLANDO, FL—(Marketwired – Dec 30, 2014) – As athletes are preparing for the 2015 Walt Disney World Marathon and Disney Princess Half Marathon, Orlando World Center Marriott — located just minutes from the parks — invites runners to refuel and recharge with a “Marathon Fuel & Run” Escape,* with rates starting at $169/Night, for stays January 8–11, 2015 and February 19–22, 2015. Offering a carb–filled dinner per night to race participants who present their registration at check–in, the weekend is guaranteed to be an unforgettable experience that is fit for everyone. Kicking the trip off with a bang, guests looking to make the most of a vacation with good friends, or getting ready for the big race day, can fuel up before the marathon with plenty of carbs at an array of taste–tempting restaurants and relieve any pain after with a rejuvenating treatment at the resort's full–service spa or simply relax while soaking up the warm Florida sun at the iconic Falls Pool Oasis. Catering to every kind of guest, Orlando World Center Marriott gives endurance athletes all they need to prepare and recover during race weekend, one mile at a time. 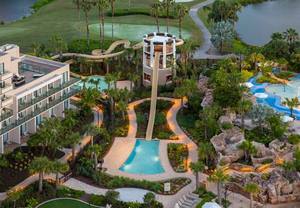 Towering above more than 200 prime central Florida acres, the Four–Diamond Orlando World Center Marriott offers everything a guest could possibly want. Having recently undergone an extensive multi–million dollar transformation, the resort now features everything on premise from the iconic Falls Pool Oasis to a championship golf course, Bill Madonna Golf Academy at Hawk's Landing Golf Club, a full service spa and fitness center, as well as 10 delectable restaurants and lounges, including a food court for guests on–the–go. In this magnificent locale, with year 'round average temperatures sitting at 78°, the 2,009–room resort is located only 1.5 miles from Walt Disney World and just minutes from SeaWorld® Orlando, Discovery Cove®, Aquatica™, LEGOLAND® and Universal Studios® Orlando. For more information on a “MARATHON FUEL & RUN” or to make a reservation, please visit www.worldcentermarriott.com and enter promotional code FOO or call 800–380–7931. * Minimum one–night stay is required, must include a Friday or Saturday night. Based on availability. Marathon registration must be presented at check–in. Rates are subject to change and blackout dates may apply. Taxes not included. Dinner to include choice of appetizer, choice of pasta or entrée and choice of dessert, as well as tax and gratuity. The Orlando World Center Marriott welcomes guests to Central Florida with impressive resort amenities, exceptional service and contemporary accommodations that allow them to make the most of their travel experience. Featuring award–winning restaurants, a rejuvenating full–service spa, four pools, three water slides and 18–holes of championship golf at its Hawk's Landing Golf Club, there's something for everyone at this relaxing destination. Conveniently located just over a mile from Disney World and only minutes from SeaWorld Orlando, Universal Studios and Legoland, the resort offers immaculate guest rooms and spacious suites, most of which include private balconies with pool, garden or golf course views. A grand destination for leisure travel, the hotel also boasts 450,000 square feet of high–tech event space ideal for hosting nearly any occasion. From its Cypress Ballroom, the nation's largest pillar–free ballroom, to the more intimate Marriott Boardroom or its elegant Spa Terrace, the hotel, with its staff of event managers and catering professionals, is dedicated to providing the perfect venue for flawless events. KAILUA–KONA, HI—(Marketwired – Dec 30, 2014) – You don't have to don a wetsuit and plunge into the Pacific to appreciate the triumphs and travails of the surfing culture. In fact, all you need is to be at the Courtyard King Kamehameha's Kona Beach Hotel on January 30 and 31, 2015. There, the goal isn't to catch the next wave, but to catch the next movie during the 11th–annual Kona Surf Film Festival. The festival returns to this beachfront hotel in Kona for its second year of screenings, concerts and art, all of which center on surfing. Guests arriving between 5 and 10 p.m. will dive into performances by Leche de Tigre or Ms. Demeanor and the Felons before settling down to a selection of independent short and feature films. Filmgoers can shop in between screenings at booths operated by local vendors; and a variety of food and beer will be available for purchase. Guests are encouraged to bring their own beach chairs and/or blankets, and admission to the festival is $25 per adult, $15 per child and free for small children. This Kailua village hotel makes an ideal location for the film festival. Not only are its surroundings worthy of royalty — it was, after all, once home to King Kamehameha — but its spacious guest rooms, white–sand beaches and award–winning restaurants are available at special rates for festival attendees. 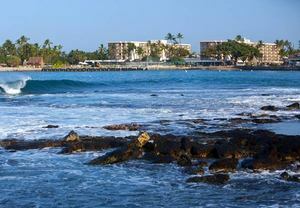 Rates start at just $145 per night when guests mention the Kona Surf Film Festival. As one of the most accommodating hotels close to Kona Airport and located on the water in the center of Kailua–Kona, the property offers plenty of reasons to linger a few days after the film festival. Guests can book a sunset cruise, try their hand at canoeing or make the trek to Hawaii Volcanoes National Park to see the world's most active volcano. Plus the historic Kailua village is also close by for a unique perspective on Hawaii's history and future. Whether visitors arrive solely for the festival or as part of a longer vacation, this Ahu'ena Heiau hotel makes sure the experience is one with a happy ending. Offering guests a quintessential Hawaiian experience, the Courtyard King Kamehameha's Kona Beach Hotel features breathtaking scenery and island–inspired luxury. Activities like canoeing, kayaking, snorkeling, stand–up paddle boarding and more are all easily available from the property and complement the hotel's beautiful outdoor pool and whirlpool. The Spa at Kona Beach inspires further relaxation with scrubs, wraps and massages, while the hotel's guest rooms invite travelers to recharge with crisp linens, thick mattresses, flat–screen televisions and dramatic views. Guests can also indulge in an authentic luau on site, or try one of the hotel's three other dining venues, including the award–winning Honu's on the Beach Restaurant. TORONTO, ONTARIO—(Marketwired – Dec 30, 2014) – Energizer Resources Inc. (TSX:EGZ)(OTCQX:ENZR)(WKN:A1CXW3) (“Energizer” or the “Company”) announces it has closed a non–brokered private placement offering of 4,900,000 common shares (“Common Shares”) of the Company (the “Offering”) at an issue price of US$0.12 per Common Share for gross proceeds of US$588,000. In connection with the Offering, the Company paid a cash commission of US$29,400 and issued 147,000 Finder's warrants. Each Finder's warrant entitles the holder to acquire one Common Share of Energizer at an exercise price of US$0.12 per share for a period of 24 months from the date of issuance. The net proceeds from the Offering will be primarily used to fund the production of purified graphite concentrate samples from the Molo Project in Madagascar and also for general working capital purposes. The purified samples are “earmarked” for distribution to off–take groups and end users of graphite who have requested such samples for their ongoing review in order to further discussions for potential off–take arrangements. All securities issued in connection with the Offering will be subject to a minimum six–month hold period as required by U.S. securities laws, and will also be subject to a four–month hold period (which will run concurrently with the six–month hold period) as required by Canadian securities laws. The Company may issue additional Common Shares in subsequent tranches pursuant to the Offering. Energizer Resources is a mineral exploration and mine development company based in Toronto, Canada, that is developing its 100%–owned, flagship Molo Graphite Project in southern Madagascar. The Molo project hosts a measured mineral resource of 23.62 million tonnes (MT) grading 6.32% carbon (C), an indicated mineral resource of 76.75 MT grading 6.25% C and an inferred mineral resource of 40.91 MT at 5.78% C. Energizer expects to release the results of a feasibility study in respect of the Molo Graphite Project within the next 60 days. Mr. Craig Scherba, P.Geo., President and COO is the qualified person who reviewed and approved the technical information provided in this press release. Safe Harbour: This press release contains statements that may constitute “forward–looking statements” within the meaning of applicable Canadian and United States securities legislation. Readers are cautioned not to place undue reliance on such forward–looking statements. Forward–looking statements are based on current expectations, estimates and assumptions that involve a number of risks, which could cause actual results to vary and in some instances to differ materially from those anticipated by the Company and described in the forward–looking statements contained in this press release. No assurance can be given that any of the events anticipated by the forward–looking statements will transpire or occur or, if any of them do so, what benefits the Company will derive there from. The forward–looking statements contained in this news release are made as at the date of this news release and the Company does not undertake any obligation to update publicly or to revise any of the forward–looking statements, whether as a result of new information, future events or otherwise, except as may be required by applicable securities laws. The NI 43–101 compliant technical report, titled “Molo Graphite Project Fotadrevo Province of Toliara, Madagascar Preliminary Economic Assessment Technical Report Update” dated April 12, 2013, was prepared by DRA Mineral Projects Pty Ltd and authored by John Hancox, Pri.Sc.Nat, Desmond Subramani, Pri.Sc.Nat, Dave Thompson and Glenn Bezuidenhout, all Qualified Persons as defined by NI 43–101, and independent of Energizer Resources for the purposes of NI 43–101 requirements. Please also refer to the technical report titled “Molo Graphite Project, Fotadrevo, Province of Toliara, Madagascar” dated September 25, 2014 prepared by Philip John Hancox, Pr.Sci.Nat. and Desmond Subramani, Pr.Sci.Nat. who are Qualified Persons as defined by NI 43–101, and independent of Energizer Resources for the purposes of NI 43–101 requirements. The Technical Reports are available on SEDAR at www.sedar.com and on the Company's website at www.energizerresources.com. Please refer to the technical reports for a discussion in respect of certain key assumptions, parameters and methods in respect to the mineral resource disclosure. The disclosure in this press release uses mineral resource classification terms that comply with reporting standards in Canada and are made in accordance with Canadian National Instrument 43–101–Standards of Disclosure for Mineral Projects (“NI 43–101″). NI 43–101 establishes standards for all public disclosure an issuer makes of scientific and technical information concerning mineral projects. These standards differ significantly from the mineral reserve disclosure requirements of the SEC set forth in Industry Guide 7. Consequently, information regarding mineralization contained in this press release is not comparable to similar information that would generally be disclosed by U.S. companies in accordance with the rules of the SEC. Under SEC standards, mineralization may not be classified as a “reserve” unless the determination has been made that the mineralization could be economically and legally produced or extracted at the time the reserve determination is made. Among other things, all necessary permits would be required to be in hand or issuance imminent in order to classify mineralized material as reserves under the SEC standards. This press release uses the terms “measured mineral resources,” “indicated mineral resources” and “inferred mineral resources” to comply with the reporting standards in Canada. The SEC does not recognize mineral resources and U.S. companies are generally not permitted to disclose mineral resources of any category in documents they file with the SEC. Investors are specifically cautioned not to assume that any part or all of the mineral deposits in these categories will ever be converted into mineral reserves as defined in NI 43–101 or Industry Guide 7. Further, “inferred mineral resources” have a great amount of uncertainty as to their existence and as to whether they can be mined legally or economically. Therefore, investors are also cautioned not to assume that all or any part of an inferred resource exists. It cannot be assumed that all or any part of “measured mineral resources,” “indicated mineral resources,” or “inferred mineral resources” will ever be upgraded to a higher category. Investors are cautioned not to assume that any part of the reported “measured mineral resources,” “indicated mineral resources,” or “inferred mineral resources” in this press release are economically or legally mineable. For the above reasons, information contained in this press release containing descriptions of our mineral resource estimates are not comparable to similar information made public by U.S. companies subject to the reporting and disclosure requirements of the SEC. BOSTON, MA—(Marketwired – Dec 30, 2014) – Surprise, surprise, surprise — Las Vegas, New York, Miami and L.A. are some of the most popular travel destinations for Americans according to searches on Cheapflights.com, the online leader in finding and publishing travel deals. As the New Year is about to kick off, maybe it's time to start thinking of new travel destinations. To help you expand your horizon in 2015, the Cheapflights travel experts compiled a Go here, not there list offering alternative travel spots to popular vacation destinations for American travelers. For example, if you want to avoid the crowds of Disney World in Orlando, check out Buena Park, California. Planning an island getaway for 2015? You may want to consider St. Lucia instead of Hawaii. If partying is more your thing, then consider Ibiza as an alternative to Cancun. Whether your plan is to travel close to home or further abroad, consider these alternative destinations for inclusion on your must–see list in 2015. Biloxi, Mississippi, instead of Las Vegas, Nevada – Roll the dice in this southern sin city, which boasts eight casino resorts serving up round–the–clock gaming and everything from upscale restaurants to headliner–laced entertainment. Top off the day with some poolside partying at one of the resorts' pool bars and lounges. With Biloxi's subtropical climate, shopping, spa services, professional golf courses, and opportunities to explore nature beyond the city, you're in for a luxurious vacation experience with a decidedly Vegas–like vibe. You won't miss the bright lights of The Strip as you take in views of the Gulf Coast from your hotel room. Toronto, Ontario, Canada, instead of New York, New York – You might be surprised to find out how often Ontario's capital city masquerades as the Big Apple on the silver screen: think “Cocktail” and “Serendipity.” Favorite flicks aside, Toronto puts up plenty of off–screen allure that allows it to go head to head with New York: a host of cool neighborhoods to explore, a multicultural population, lots of arts and culture offerings with major live music and theater performances, a stunning skyline, a burgeoning fashion scene with both high–end and vintage shops (we're even talking an entire underground network of shopping and entertainment opportunities), and a bevy of bars you can belly up to any night until 2 a.m. — maybe even 4 a.m. sometime soon if LastCallTO gets its way. Buena Park, California, instead of Orlando, Florida – There's simply just no other destination that contains Disney World, but a city known as one of the “most fun” places in America might be a close second. Home of the first theme park in the U.S. — Knott's Berry Farm — Buena Park sits just southeast of L.A. This entertainment–laden locale serves up more than 165 rides, performances and other attractions, a seasonal 13–acre water park and family–friendly dinner shows. You can even get a touch of Disney magic with a visit to Knott's Berry Farm's Camp Snoopy. Beyond the theme park fun, the city features a Historic District, museums and nearby beaches. And if you still feel like you need a little actual Disney, Disneyland is only about a 10–minute drive away. St. Lucia instead of Hawaii – Skip Hawaii and say “aloha” to the island of St. Lucia. This tropical Caribbean paradise gives vacationers a combination often sought after in The Aloha State — adventure and relaxation. St. Lucia's rugged coastline, lush, enchanting scenery and romantic vibe mimic many a Hawaiian hot spot. Trade luaus for beach barbeques, those famous Hawaiian tunes for St. Lucia's popular folk music and the hula for Caribbean dance. Tour — or even book a room at — the Fond Doux Plantation where chocolate is made from the harvest of the property's cocoa groves. The island also serves up volcanoes to explore, including Sulphur Springs, a drive–in volcano. With plenty of fresh seafood caught in nearby waters, picturesque beaches and local drinks, the aloha spirit never feels very far away. Ibiza, Spain, instead of Cancun, Mexico – Nightlife tends to be the cornerstone of a Cancun vacation, and where better to get the same rockin' atmosphere but Ibiza. Chock full of clubs, bars and discos, this Mediterranean island off Spain's eastern coast (popular with European travelers) will not disappoint during party season, which lasts from about June to October. Summertime on the Spanish island is sure to be raucous with well–known DJs and music groups filling up the venues. Surrounded by turquoise waters, like those you'll find in Mexico, and peppered with cultural sites, Ibiza delivers more than just drinks, beats and dancing. In fact, there has been a recent push to transform Ibiza into a more family–friendly destination. But make no mistake about it, this is still party town numero uno with the clubs keeping their doors open well into the early morning hours. Rounding out our list of “Go here, not there” options are: Cincinnati, Ohio, instead of Chicago, Illinois; Montevideo, Uruguay, instead of Miami, Florida; Belize instead of Costa Rica; Vancouver, British Columbia, Canada, instead of Denver, Colorado; and Sydney, Australia, instead of Los Angeles, California. To read more about these alternatives and Cheapflights.com's complete Go here, not there: 10 alternative destinations for American Travelers, visit: www.cheapflights.com/news/go–here–not–there–10–alternative–destinations–american–travelers. Momondo Group is an online travel media and technology company that is driven by the belief that an open world is a better world. The group now serves travel search and inspiration to over 17.5 million visitors a month — plus 7 million travel newsletter subscribers — via its Cheapflights (www.cheapflights.com) and momondo (www.momondo.com) brands. Skygate began the sourcing of complex air–travel data in 1992, while Cheapflights pioneered the online comparison of flight deals for users in 1996 and momondo launched meta–search in the Nordic countries in 2006. BOSTON, MA—(Marketwired – Dec 30, 2014) – On January 5, 2015, ANTIQUES ROADSHOW, PBS's most–watched ongoing series, kicks off Season 19 with a home–run appraisal of an early Boston baseball archive for $1,000,000. ANTIQUES ROADSHOW's new season features 35 never–before–seen episodes of its signature cross–country treasure hunt. Host Mark L. Walberg welcomes viewers to join the 12–time Emmy® Award nominated production of WGBH in sharing a new year of America's hidden treasures and untold stories starting Monday, January 5 at 8/7c on PBS. ROADSHOW begins the season with its first trip to New York City in 13 years, catching the largest sports memorabilia find in the 19–year history of the series: an archive of rare photographic baseball cards with a handwritten letter from the 1871–1872 Boston Red Stockings. The letter was addressed to the owner's great–great–grandmother, who ran the boarding house that homed the team and features notes from pioneering Hall of Famers Harry Wright, George Wright and Albert Spalding. ROADSHOW's visit to New York City also included appraisals of a Joseph Kleitsch painting valued at $500,000 and another baseball card collection worth $200,000. ANTIQUES ROADSHOW will also be announcing their Summer 2015 tour dates on January 5th at pbs.org/antiques. Part adventure, part history lesson, part treasure hunt, 12–time Emmy® Award nominated ANTIQUES ROADSHOW is in its 18th broadcast season and is the most–watched ongoing primetime PBS series. The series is produced by WGBH Boston for PBS under license from the BBC. The Executive Producer is Marsha Bemko. ANTIQUES ROADSHOW is sponsored by Liberty Mutual Insurance and Subaru. Additional funding is provided by public television viewers. ANTIQUES ROADSHOW press materials, including streaming video and downloadable photos, are available at pbs.org/pressroom.